The right eyeliner can help you look this good. Applying and removing eyeliner is a breeze with blinc eyeliner. It is water-resistant. If weddings and sappy commercials bring you to tears at the drop of a hat, you're probably familiar with runny eye makeup. Give yourself one less thing to cry about - this eyeliner won't smudge, fade, run or flake, no matter what you do. It is not susceptible to tears, eye-rubbing or nature's elements. It is safe for people with sensitive eyes. If you wear contact lenses or suffer from allergies, you probably avoid certain brands of eye makeup in order to avoid discomfort and irritation. Blinc eyeliner is specially formulated with fewer ingredients than typical eyeliners. As a result, this hypoallergenic product is less likely to cause a reaction on people with sensitive eyes. It is effortless to remove. They made the easy-on, easy-off method famous with their famed mascara. Now blinc offers the same technology in their eyeliner. 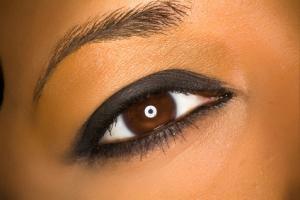 It is the only eyeliner on the market that requires only a swipe of the hand and a splash of warm water to remove. It is easy to control. The tip is soft and malleable, yet sturdy enough to draw either a fine or a thick line. The extra-thin brush makes it easy to draw a straight line. Make sure your eye area is completely dry before application. This eyeliner requires a completely clean application surface in order to appropriately adhere to the skin. Do not apply any substances, such as concealer, foundation or moisturizer, to the eye area prior to application. Wait one minute after application to allow the eyeliner to set. Do not apply the eyeliner to the inner rim of the eyelid. Though this is generally considered an unsafe practice because it can cause infections, many people do wear eyeliner on the inner rim regularly. However, this eyeliner is designed to work on a clean, dry surface, so the wet inner rim of the lid is not a practical spot to apply the makeup. The aluminum screw-top storage cylinder is reusable! This is a surprisingly handy little tool that is ideal for storing small items, such as bobby pins, tweezers or eye and lip pencils, in a purse. Plenty of warm water and gentle pressure are the two main ingredients necessary to successfully remove this eyeliner. It literally slides off the skin as the pressure and water combine to release it. This is easily accomplished by applying pressure with a wet hand, washcloth or with a showerhead. Be sure to use enough water - the eyeliner is extremely long-lasting and water-resistant, so its removal depends on a strong combination of force and moisture.